The side gig economy means that average people like you and I can trade our time and skills, when we’re off the clock, and make a little extra money. This is typically called a side gig or a side hustle, and it’s basically more work (preferably work that you’re passionate about and good at) in exchange for more money. Worldwide people are working their way to a more financially free lifestyle by using side gigs to supplement their income. And a lot of them are taking their side gig full-time when the opportunity arises. But, is the side gig lifestyle really for you? Should You Have a Side Gig? I am whole-heartedly in camp pro side gig. The added financial benefit aside (though that’s a huge part) having a side gig means allowing yourself the ability to explore your passions and (hopefully) turn them into cold hard cash and teaching yourself to be a full-fledged entrepreneur. Whether you dream about being a full-time entrepreneur in the future or simply use a side gig to help boost your income, practicing entrepreneurship actually has great benefits to you both personally and professionally. From a professional standpoint, having an entrepreneurial spirit helps you to develop an eye for the bigger picture, stretch your creative problem-solving skills and learn to work with people for the benefit of not only a company but yourself (happy employees typically make for good ones) — all of this is great for companies. From a personal perspective, having a side gig (especially one you’re passionate about) teaches you to dream bigger than you are. Truthfully, careers tend to be limited mostly by the needs of the company. So if you love your job but there isn’t a lot of room for you to move at this point, having a side gig can help you realize your potential and get rewarded for your good work while you wait for the next professional move. Plus, like I mentioned, there’s an added financial benefit. And if you’re looking to head on a vacation, plan for your retirement or even buy a house, it’s never a bad idea to have more money come in. The key to getting started is finding something you both want to do and have the skills to do. If you want a side gig but honestly don’t know where to start, you can kick off your adventure by simply making a list of all your skills, passions and interests. Once you have that list, do some research and find out what other people are doing in that space. Freelance writing — Skills needed? The ability to write, self-edit and a topic you love to talk about. Social media management — Skills needed? A deep knowledge of one or more social platforms and the ability to sell your services. Graphic design — Skills needed? Graphic design skills and access to a design program. Teaching English online — Skills needed? A good grasp of the English language, a love of teaching and a patient and positive attitude. Blogging — Skills needed? The ability to write and a topic to write about. Selling an online course — Skills needed? The ability to write, design and create a course, and a topic to create one based on. Walking dogs — Skills needed? A love of all things dogs and some time to walk them. Creating YouTube tutorials — Skills needed? Something to teach, and a computer and microphone to record your tutorials. Oh, and a YouTube account! Homemade products — Skills needed? The know-how and skills to make homemade products (i.e. candles, scarves, make-up, etc. ), the supplies to do it and somewhere to sell (like Etsy). The gig economy has made it so you can pretty much make money doing anything. I have a younger cousin that spends all of her afternoons watching YouTube videos of other people playing video games — the number of views these videos have? Hundreds of thousands. I’m not kidding. 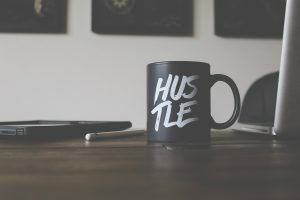 One of the biggest challenges for most people when it comes to working in the gig economy and trying to build additional cash flows is the fear of the hustle. And by that I mean, they’re often terrified of selling their services. I wish I could tell you that there was some checklist you could go through that would make you an instant sales expert, but I’ve yet to find one myself. My advice? Just start. The first few are going to be incredibly painful, but eventually, you’ll get the hang of genuinely selling your services. One of the things that I always tell myself is that my biggest value as a side gigger (is that a word?) is that I am incredibly passionate about what I do. Sure, I can write. Sure, I’ve made a ton of marketing plans throughout my career. Sure, I know how to run social media… but so do a lot of other people. What I have that they don’t have is the fact that I’m me. So, whatever you do whether it be selling candles, walking dogs or penning a weekly blog on the million and one ways to unclog your drain without having to call a plumber (seriously, can someone please start this blog?) market yourself like you’re the best in the business and one day you might very well be! Do you have a side hustle? Share it in the comments below!